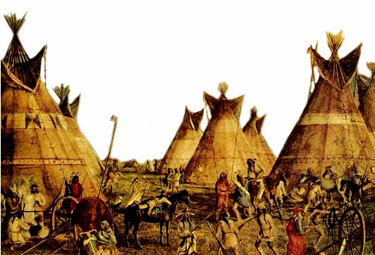 Indian Village has been an online resource for locating Native American Indian information since 1998. It includes Native American History, Culture, Indian Arts & Crafts and links to important informative websites. Indian Village is based in Durango Colorado, so you will find a lot of information that relates to the Southwest Native American Indian culture, events and Tribes. Our family has lived in the Southwest since the 1940's and we have been deeply involved in the culture of the Southwest. We own several Turquoise mines & have been Jewelry producers since the late 1960's. Visit our Store Durango Silver Co.
Indian Village is an extensive Native American Indian Business Directory for your additional research into the Native American Indian World. Indian Village includes Native American history, Indian museum links, Native American Indian Arts & crafts, Government and Tribal links, Turquoise and Turquoise Jewelry information. We provide good Native American Indian resource links and a Business Directory for your easy access to important additional information. We also recomend visiting one or more of our other Internet resources. If you are a Turquoise lover, check our Bisbee Turquoise, Royston Turquoise and Tortoise Turquoise Sites. If you are inquisitive and would like to read about Turquoise in General go to the Turquoise Facts site. And if you are coming to the Southwest,(Four Corners Region,) be sure to visit Mesa Verde. would assimilate into mainstream society and disappear as unique peoples. But native communities in both the United States and Canada survived disastrous assimilation efforts. Instead of disappearing, they revitalized tribal governments, created modern economies, attained legal rights, and revived cultural traditions and ceremonies that had nearly died out. They combined aspects of their traditional cultures with contemporary life without sacrificing the core of their identity. reported they were Native Americans. Some 1.5 million others reported they were Native American plus another race, typically white. The two figures together represented a 26 percent increase over the 1990 census figures. Overall, Native American people accounted for about 1 percent of the total U.S. population.